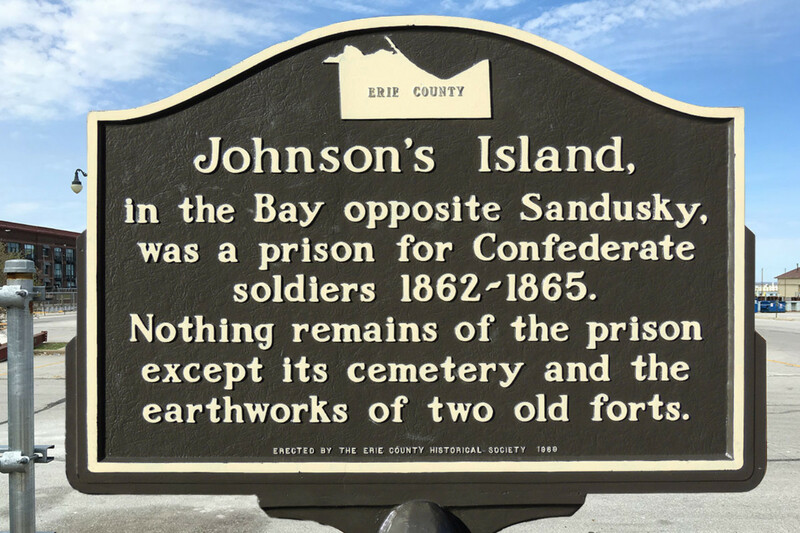 Also at the entrance to the Jackson Street Pier is an historical marker providing information on Johnson’s Island and its Confederate Prison. 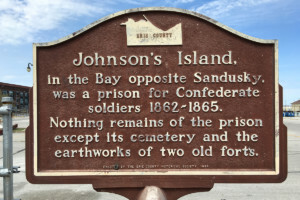 The location of this marker may be confusing to some people because Johnson’s Island is located almost directly north from the end of the Jackson Street Pier, approximately two miles from downtown Sandusky in Sandusky Bay. Visually it is difficult to distinguish because on the horizon it blends into the Marblehead Peninsula, which is the large land mass behind it. From 1862 to 1865, the United States Army operated a prison for Confederate officers on Johnson’s Island. Approximately 15,000 Confederate officers spent time on the island during its course of operation. The prison population averaged about 2,500. There were several individual escape attempts and a few were successful. There was one organized attempt, in September, 1864, involving a plan for Canadian-based Rebel spies to seize the warship U.S.S. Michigan, anchored in Sandusky Bay, turn its guns on the prison, and free the prisoners, who would flee to Canada or the Ohio mainland. The attempt failed when U.S. forces were made aware of the plot in advance. While summers were pleasant, winters were difficult for Southerners unused to a Great Lakes climate. Although conditions were hard, Johnson’s Island was one of the best run prisons, North or South, and had one of the lowest death rates. Approximately 250 prisoners died there during captivity. Some were disinterred and returned to their homes in the South after the war; however, 206 are buried at Johnson’s Island. The cemetery is maintained by the Federal government and is open to the public. A monument to the deceased soldiers was erected in 1910 by the United Daughters of the Confederacy, Cincinnati Chapter. For the past two decades the prison site has been the object of a significant archaeological investigation directed by Heidelberg University. Most of the island is currently residential. 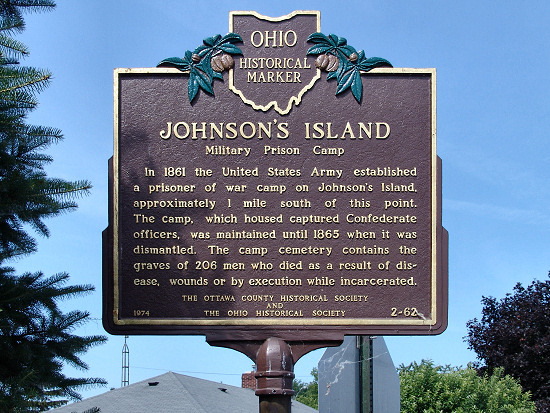 At the corner of the street (Gaydos) leading to the causeway, there is another marker for the Johnson’s Island prison.